Ivy Cottage Guest AccommodationIvy Cottage Bed & Breakfast is situated on The Village Geen in the pituresque village of Reeth in Swaledale. 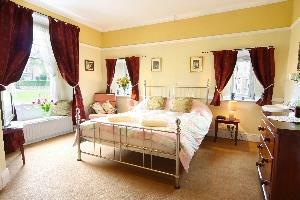 We offer comfortable accommodation in our three attractive double rooms. All have tea and coffee making facilities, electric blankets, colour TV and central heating. All rooms are non-smoking. Two of our rooms are en-suite and have views of The Green & beyond. We are ideally placed for visiting all of the Dales area and are particularly popular with walkers and cyclists. Reeth is on the Coast to Coast and Herriott Way routes. Ivy Cottage is situated on The Green at Reeth. Rooms have views of the green and the hills beyond. We are ideally placed for tourism the Dales and have easy access to Richmond, Leyburn and Barnard Castle. High chairs available Children welcome from any age. Small room with shower, hand basin and toilet. Standard double bed. Suitable for single occupancy or for 2 people for a short stay. Central heating, 24" flat screen TV. With DVD player. Tea and coffee making facilities. Toiletries and towels provided. NB. This room does not have a view of the Green. It does however have a window seat with side views to the surrounding hills. From the A1 take the A6108 to Richmond and then take the B6270 tp Reeth. Everything was spot on from the moment we arrived.A nice selection of complimentary food, great kitchen and just so much stuff around to do if we had more time available - I wish we had. Thank you very much for taking the time to write this review. So pleased you enjoyed your break, and hoping one day you will be back.